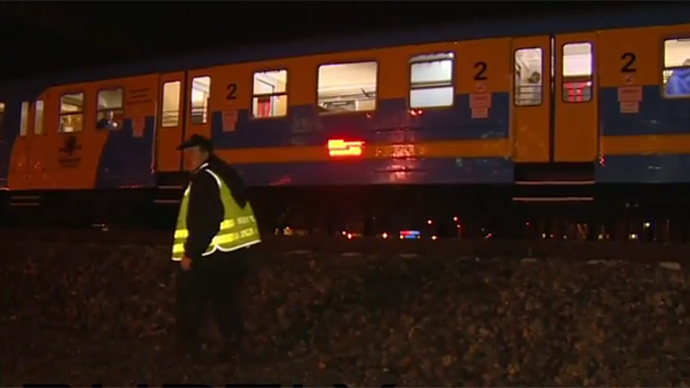 Several dozen masked people have attacked a passenger train with Mixed Martial Arts fans onboard in Poland. An investigation in the brawl that left up to 10 people injured has been launched. The attack happened late on Saturday, when between 100 and 200 people, according to varying estimates, in masks and black attire stopped the train at Gdansk Zabianka railway station. "First someone threw stones at the train, then someone on the train pulled the emergency brake," Maciej Steplewski from Gdansk police told Polish Press Agency. At least three windows were smashed in the attack. According to Steplewski there were “about a hundred” masked assailants, but local Radio Gdansk citing local witnesses reported of 150-200 people involved in the brawl. Many of the train’s passengers were fans of Mixed Martial Arts (MMA) travelling to a competition in Sopot, a town in northern Poland. Steplewski said that the investigation believes that both sides involved – the attackers and the fans – are what he called “hooligans”. At least five people, including one woman, have been hospitalized, Steplewski said. Four of them received non-threatening injuries, while the fifth is unconscious. The witnesses at the scene, however, told Radio Gdansk that dozens were injured. On Sunday, police arrested six people in connection with the train attack. They are now being interrogated. The exact motives of the attack are yet unknown. Investigators are now working to determine the identities of the attackers, Steplewski said.